In 1970, a Danish scholar and professor by the name of Niels-Erik Andreasen arrived on the Pacific Union College campus. He taught religion on what he refers to now as "that holy hill" for seven years before moving on to Loma Linda University (Loma Linda and Riverside, Calif.), Walla Walla University (College Place, Wash.), and finally, Andrews University (Berrien Springs, Mich.), where he served as president for 22 years—the longest-serving and first internationally born president there—until his retirement in 2016. 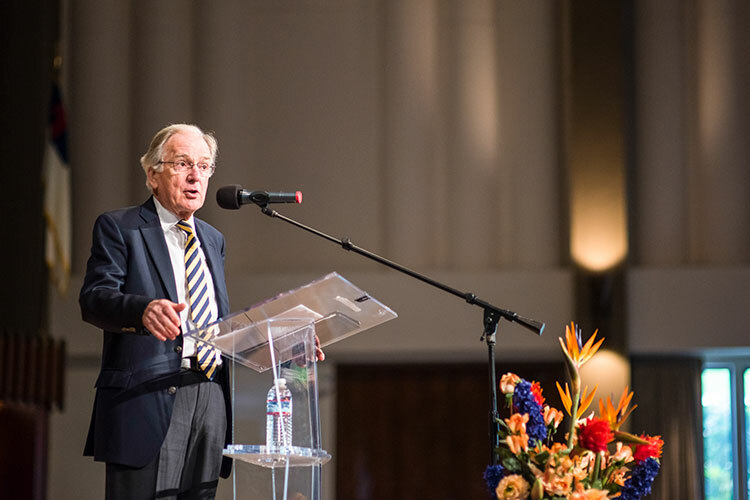 Andreasen and his wife, Demetra, have returned to St. Helena, Calif., in their retirement, and on Thursday, May 3, Andreasen presented for Colloquy in the PUC Church. His topic was The Joy of Christian Education. "I have a confession to make," he began. "There's nothing I would rather have done in my life than teach and study. And if I could live my life over again, I'd return to college and sign up as a freshman right now. You may be eager to get out, but I'm eager to return." There is safety in the student life, Andreasen pointed out, urging students to enjoy it, as he used to do in his college days. He recalled that in Denmark, they celebrated the joy of student life quite often, especially in May, the last month of the school year. They would often burst into spontaneous classroom renditions of old student songs in Latin, moving through the stanzas standing next to their desks, then on their desk chairs, and finally, for the final verse, standing on their desks. Meanwhile, the teachers would stand in the hallway, laughing at the silliness of the students. "We did have fun being students," Andreasen said with a smile. "College is one of the most enjoyable parts of your life." There is, however, admits Andreasen, a serious side to college, too. And that, he posits, is actually another reason to be joyful. Sharing some statistics, Andreasen pointed out that less than 40 percent of Americans have a college degree, and under seven percent of the world's population have been to college. "Ninety-three percent of the people in the world can only dream of doing what you're doing today," he said with feeling. "You can learn anything you want." Andreasen admitted college was not all fun and games for him, studying was hard; just like students today, he'd cram for a test the night before and then forget it all in the morning. He quickly added what matters in education is not just facts, equations, dates, and Bible verses, but also bright ideas. "Imagine you picked up four to five new ideas every week during college," said Andreasen. "That's around 600 really brilliant ideas while you're here. That could change your life." He wasn't just speaking to students; Andreasen specifically addressed professors, as well: "Do we also sing?" he asked. He began with a story. When he arrived at PUC nearly 50 years ago, he was younger than most of his colleagues. In response to a letter from a former dean inquiring as to how things were going, Andreasen said, "Quite well! I'm really enjoying working with the students, but the curriculum is a little stuffy and dusty. Should I try to change it?" After a long period of waiting, Andreasen finally received a response: "A good teacher does not depend on the curriculum to teach well," the dean said in his letter. "They learn from you, not the curriculum. For now, don't try to change anything but the students' minds. Make them furious. Make them curious. Support the truth and commit to it." Andreasen considered that letter his first lesson in College Teaching 101. With this idea in mind, he made himself available and opened his home to students. One student in particular would often come sit on the floor in conversation with Andreasen well into the night. At one point he asked Andreasen if he could borrow books from his office, to which Andreasen replied, "No, but you may have a key to my office and spend as many evenings there as you'd like, reading any book you care to read, and we'll discuss it in the morning." When Andreasen retired from Andrews University many years later, this student was a department chair there. Speaking at Andreasen's retirement event, the man said, "You made me feel like a professional in the making, right there in your home." "We draw our students in," Andreasen stated in his talk. "They're smart and ready for full participation but inexperienced. We teach them, develop them, grow them, watch them mature, laugh, cry, and prepare them to live a vibrant life of the mind to complement a vibrant life of faith. Keep them faithful. That's the joy of teaching. Never regret it, and never forget it. Your students will remember for life." Despite these joyful anecdotes, Andreasen admits that education—even Christian education—isn't always easy. Even with those dark days, Andreasen asks, how do we make it all work? Is there a way for the joy of Christian education to shine through? "Here is my formula for making that happen," he said. "We begin with a strong commitment to teaching and learning. Then we add a good dose of altruism, because Christians teach and learn for the benefit of others. We do not seek to become famous, we seek to become helpful." Andreasen continues his recipe with a pinch of humility, and stirring in the warmth of Christian piety, faith, fairness, love, and hope. "If we follow this formula," Andreasen concluded, "we will believe far better than we ever thought possible and learn much more than we ever imagined." Andreasen encouraged students to consider the rare opportunities a Christian education presents. He indicated that education should be a party and learning should be a joy, and that if he were young again, he'd pick up his iPad and class schedule and join them. "Whether you're a student, faculty, staff, or administrator, I congratulate you for casting your lot in Christian education at this place," commended Andreasen. "It's a good thing to do, and it's a good place to be. Do not forget the joy of a life of the mind and a life of faith. Take hold of both and hold fast, as though your future depended on it. Who knows? Maybe it does."